Why Breezair is better...Breezair goes beyond cool to deliver the best evaporative cooler on the market today! Breezair is engineered for long lasting performance and guaranteed to look great for years. From its economical operation to its low maintenance and extensive warranty, Breezair is designed to outperform all other evaporative coolers. All natural and costs less than A/C Breezair is also environmentally friendly using far less electricity than refrigerated cooling. Conventional air conditioners use chemicals such as Freon to artificially cool the air. Breezair uses no harmful chemicals and costs up to 80% less to operate than refrigerated cooling. And because Breezair coolers continually bring in air from the outside, rather than recirculating the same stale, dry air over and over again, it's healthier. How does evaporative cooling work? As water evaporates, it uses up heat, leaving the surrounding air cooler. Breezair coolers continuously draw air through a special damp pad. As air is pulled through the pad, dust, pollen and contaminants are filtered out and water evaporates, leaving cooler, cleaner, fresher air. It's the healthiest, most natural way to beat the heat. Standard Features Breezair High Performance Evaporative Coolers include many exclusive standard features that dramatically improve cooling performance and reduce running costs and maintenance needs for years to come. It's streamlined, low profile design, blends beautifully with any home or roof design. Breezair cabinets are constructed of high strength weather resistant molded polymers that are guaranteed never to rust, fade, chip, crack or corrode. Built "Breezair-tough," the cabinets are designed to withstand years of sun, heat and weather abuse . The high-density cross-corrugated cellulose pads distribute water evenly and have the highest cooling efficiency of any evaporative medium on the market today. The water distribution system keeps pads totally saturated for higher levels of cooling performance. The exclusive one-piece aerodynamic fan design delivers the largest volume of cool air possible. That means better cooling, quieter operation, longer motor life and lower operating costs. Quality is guaranteed for 25 years! Breezair Coolers are guaranteed to give high performance with low maintenance for a long, long time. The weather-resistant cabinet is guaranteed for 25 years, and all structural components include a 10-year warranty. All other parts have a 2 year warranty. The Breezair High Performance Evaporative Cooler will provide years of cooling comfort. Accessory Options, Now standard Equipment In addition to being the best high performance evaporative cooler money can buy, Breezair offers a complete line of "ComfortCool'' accessories. These are designed to increase cooling performance and comfort as they reduce maintenance and operating costs. That's what we call Beyond Cool! The Breezair variable speed motor automatically adjusts the airflow to maintain the comfort level desired. Plus, the Breezair motor uses less wattage than standard motors. The result? Far lower operating costs. Designed specifically for use with the Breezair Variable Speed Motor, the exclusive SensorTouch thermostat control precisely adjusts the air flow from the Cooler to maintain the desired comfort level. Comfort levels and start-stop times can be pre-set, optimizing both comfort and energy efficiency. The Breezair Water Manager monitors water quality electronically and detects harmful impurities in the water before they build up on the pads. The Automatic Drain System enables the Breezair cooler to be completely clean and dry when it's not in use which helps eliminate algae build-up. Important Note: Both the Auto Drain and Water Manager Systems are standard equipment on the BreezAir Elite EXV with the variable speed SensorTouch control. The 2 speed EXT series offer these accessories as options and do not support push button auto drain operation. Peace of mind Evaporative coolers require routine maintenance including springtime start up and, more importantly, wintertime shut down to prevent freezing of the water line. 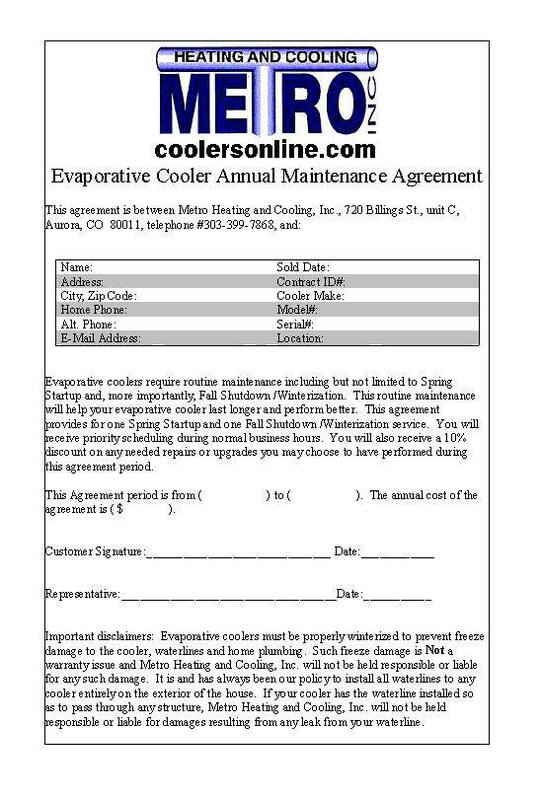 Every Breezair cooler we install comes with a 1 year service agreement at no additional charge. We will perform a full start-up on the cooler when we install it, then perform the winterization when you schedule it this fall. We will also return next spring to perform another full start-up to prepare for next summer. This won't cost you anything! Many people take advantage of the start-up and shut down services to learn about taking care of their own coolers. We are happy to show you what to do during our seasonal visits. What it all adds up to is the best cooler with the best service and support for years to come.